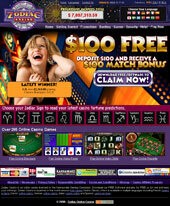 Another great casino brand from the famous Casino Rewards Group is the Zodiac Casino. The Zodiac casino has as its theme the zodiac and offers a range of exciting games and promotions to its players. The casino is licensed by the Kahnawake Gaming Commission and is a member of the Interactive Gaming Council (IGC). All games are conducted fairly at this casino, proof of which is the seal of approval from eCOGRA and the fact that all its payouts are audited regularly by independent auditors. Players get an exciting bouquet of bonuses at this casino, including a welcome bonus, a referral bonus, and more. The casino is available in 16 different languages and supports transactions in multiple currencies. Customer support is available 24×7 at this casino. Security: Zodiac casino uses industry-standard 128-bit secure socket layer (SSL) encryption technology to provide complete security for players’ transactions at the casino. Moreover, it guarantees complete confidentiality for any personal data that the player may have given to the casino while opening an account with it. 80 chances to become an instant millionaire for $€1 PLUS $€480 on the following 4 deposits! Every new player is eligible to receive 80 chances to win the jackpot for just €1! Use your 80 chances on Mega Moolah and you could win the multi-million pound jackpot! Playing at Zodiac casino gives players access to the CasinoRewards loyalty program, which is well-known throughout the industry. Players get VIP loyalty points when they play at the casino, and access to this loyalty program enables them to redeem these points for cash later. Additionally, players can use up VIP loyalty points they may have earned at any of the other Casino Rewards casinos while playing at Zodiac casino. Zodiac Casino, like other online casino brands from the Casino Rewards Group, runs on Viper software from Microgaming. The software is available for download to a computer, and there is also a Mac-compatible instant play Flash casino that players can use to play directly from a browser. Players can choose from 461 fantastic games at this casino. The games available include slots (classic and video slots), table and card games, specialty games, video poker, and a range of 16 superb progressive jackpots. Zodiac casino processes bets in four major currencies – US Dollars ($), GBPs (£), Euros (€), and Canadian Dollars (CAD $). The casino supports multiple payment methods to help players deposit and withdraw funds. Credit/Debit Card (Visa, MasterCard, Maestro, Solo and Diners Club International), EntroPay, Click2Pay, NETeller, ECO Card, Skrill (MoneyBookers), EZIPay, Direct Bank Transfer, Wire Transfer, eCheck, UseMyWallet, Ukash, PaySafeCard, UseMyBank. Mailed checks, Use My Wallet, Eco Card, OCT (Visa), Courier Checks, Wire/DBT/Swift transfer, NETeller, EZIPay, Skrill (MoneyBookers), Click2Pay, Initial CADEFT and ACH. If you ever encounter a problem at the online casino, don’t panic. Zodiac Casino has one of the best customer support teams in the industry. They’re friendly, they’re professional, they’re knowledgeable, and best of all, they’re actually effective. Customer support is online 24 hours a day and 7 days a week, the whole year round, even on holidays. Furthermore, you can reach them via email, phone, or live chat, whichever method you prefer. Indeed, it’s rare that you’ll encounter a problem at Zodiac Casino, but if you ever do, the solution will always be right around the corner with the help of their customer support.